To me, summertime means ease, simplicity, and freshness. Not just in the way we eat, but in the way we live. I believe this quick appetizer signifies all of those things. With only 4 ingredients, (not including salt, everyone should have that on hand), who wouldn't want to whip this up for a quick bite at their next party? Growing up and still to this day, cantaloupe has always been one of my favorite fruits. I legitimately feel as though I have hit the jackpot when I slice open the perfect melon. I attempt to use all the old southern tales that are supposed to help you in picking the right cantaloupe, which more often than not find me in the store with strange stares, but hey, whatever works. 1. Bring the balsamic vinegar to a boil over medium heat. Reduce to simmer and heat until the vinegar thickens, about two minutes. 2. 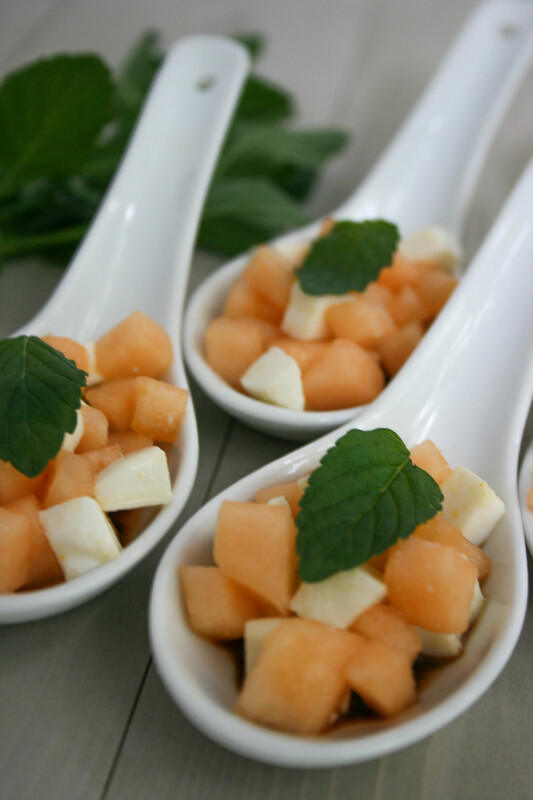 Toss the diced cantaloupe and the diced mozzarella in a small bowl and season lightly with salt. 3. Lightly coat the bottom of the spoons with the balsamic glaze and spoon the cantaloupe + mozzarella mixture on top. 4. Garnish each spoon with a mint leaf.